Something a little bit fun. I haven't really shared these things about me on here before, so here you go you can learn some weird and wonderful things about me!! 1. I can stick my whole fist in my mouth (it isn't pretty). 2. I have only had stitches once. It was in the back of my head, and was the result of a failed backflip into our pool. 3. 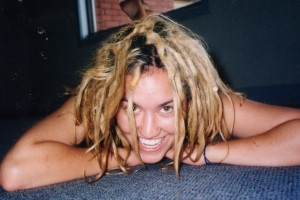 When I was 18 I bleached my hair and got dreadlocks. A year later I cut them all off to raise money for a missions trip to Japan. 4. I worked as a waitress at an Amish themed restaurant in Florida , USA for almost two years. (Troyer's Dutch Heritage). I miss my lovely work colleagues, you ladies are awesome! 5. I am slightly addicted to watching The Bold and The Beautiful. I got suckered in somehow and now it had become a regular part of my day (don't judge me). It's my guilty pleasure. So, that's it! If you knew all 5 then you probably know me really well. But that would mainly only be family and I have kept number 5 a secret from everyone for a long time! In Perth it is the weekend already, so I'm going off to enjoy it!